1.Fashionable and convenient. You can use them together or individually . Suitable for use in everyday. 2.Rich and beautiful colors are especially suitable for most of young ladies and girls. Also is a best gift for your family or friends. 3.The large handbag is also very suitable for dating, vacation and other occasions. The messenger bag can carry small items when you go shopping and dating. The wallet clutch can be used as a wallet . Very convenient to use it in daily life. 4.If the handbag broken,damaged or wrong handbag you received, customer only need to contact and send a picture to us by E-mail, and then we will give you refund or resend a new one to you and you don't need to return it to us. If the handbag have a little bit leather smell. Please open it and put it outside for several day. If you have any questions,please feel free to contact us,we will reply you within 24 hours. Thanks for your support on our store. 5.Due to differences between monitor displays, actual color may vary slightly from image.Please allow a 1-3cm measurement error due to the manual measurement. 6.NOTE:Wash it with clean water in ordinary temperature. DO NOT wash it with hot water and alkaline detergent. Hang to dry and store in ventilated place. Well made and fashion design: Made of good quality synthetic leather fabric and polyester lining with durable gold hardware. Dimension:Handbag:12.6x10.64x5(W*H*D), Handle height:10.24inch. Messenger bag:10.24x7.29x3.74inch(W*H*D),long shoulder strap length:49.25inch. Wallet clutch:9.65x6.5inch(W*H). Totel weight: About 0.87kg/1.92pound. Please refer to the size before you purchasing. Thanks for your kindly understanding. Tote bag Pockets:One main zipper compartment with one inner zipper pocket,one back pocket and two slot pockets. 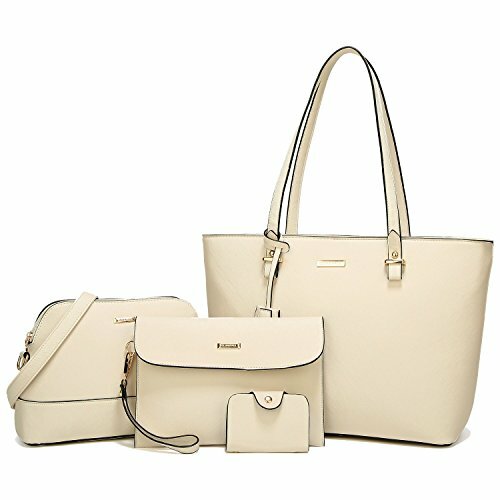 4pcs: One large handbag+one messenger Bag:+wallet clutch+card holder. Perfect for dating,shopping,working,traveling, vocation, party and other occasions and keep your daily items well organized. About ELIMPAUL: ELIMPAUL is an US trademark registered by Bags family. Please do not use our brand without our permission. Thanks for your cooperation. If you have any questions about this product by ELIMPAUL, contact us by completing and submitting the form below. If you are looking for a specif part number, please include it with your message.